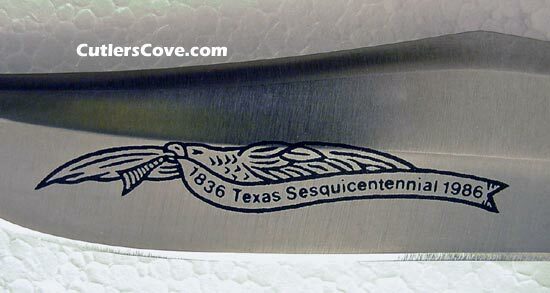 Parker & Son Texas Sesquicentennial with bark stag handles. Mint 5" closed pattern M-1466. It has serial number 199 on the front bolster. The bolsters need polishing. We only have one to sale. Be sure to look for the other knives we have in this series for sale! Each are part of the Parker & Son Texas Sesquicentennial Series of 16 Knives with bark stag handles that came out in 1985 for the 1986 event. There were only 1200 of each pattern made. Bark stag (sometimes called second cut stag) is the interior part of the deer antler to which a special jigging and dye has been added to the surface to give it a unique appearance. The series is one of the best and most unique set of items ever made for and about the Long Star state of Texas. They are the best knife group ever made dealing with Texas that we know of. Be sure to look for the other knives we have in this series! Copyright © 1999-2012Cutler’s Cove Knife Emporium ™ All rights reserved. * Price is based on Pocket Knife Trader's Price Guide Vol. 6 ©2003 by Jim Parker. Eight year old price has a little added to each!